Written by Janet Choi on September 21, 2017 . Welcome emails are crucial. The moment after you first sign up for a service is when first impressions are made. But what happens after your initial welcome email? We’re all used to getting those chipper “Welcome!” emails from the services we sign up for. One touchpoint is easy to forget. Plus, almost everyone does a welcome email and repetitive patterns are easy to tune out. Post-welcome emails, which continue and develop a kind of conversation with your customer, can make you stand out. Casual checkup: These are usually short, plaintext-style emails from a product manager or founder, requesting feedback and offering any help you might need. Quick conversion: These emails attempt to get you to add a friend, follow a topic, or perform some other kind of quick conversion action. Value sell: These emails attempt to show you more product value and convince you to return. The close: Seen more often with products where you buy a single-use license, these emails try to get you to buy relatively quickly. 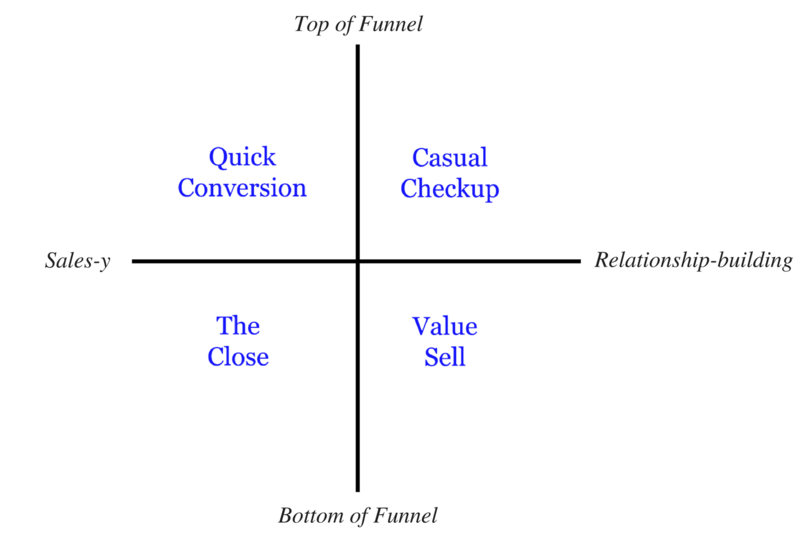 More specifically, you can place each type in a distinct quadrant along two axes — funnel position and technique. Funnel: If a company expects that people are closer to buying around the time of the welcome email, a bottom of funnel email is more likely. If they’re prepared for the buying cycle to take a bit longer and want to raise awareness in the meantime, a top of funnel email is more likely. Technique: If a company is primarily concerned with getting its users to perform a specific, quick action, you’re more likely to see an email with a direct request for a conversion. If they’re seeding a future action, you’re more likely to see a relationship-building post-welcome email. Of course, within each kind of email, you’ll have variation and types blending into other quadrants. Quick conversion emails can look like casual checkups, and vice versa. The key is to understand what you’re trying to accomplish with every post-welcome email you send and then tailor them to that purpose. …why did you sign up?… Would love to learn more about what you’re working on. Asking your customers for feedback and context on why they’re using your product is a powerful way to learn. It works best when your product and team are small enough to manage all the replies. 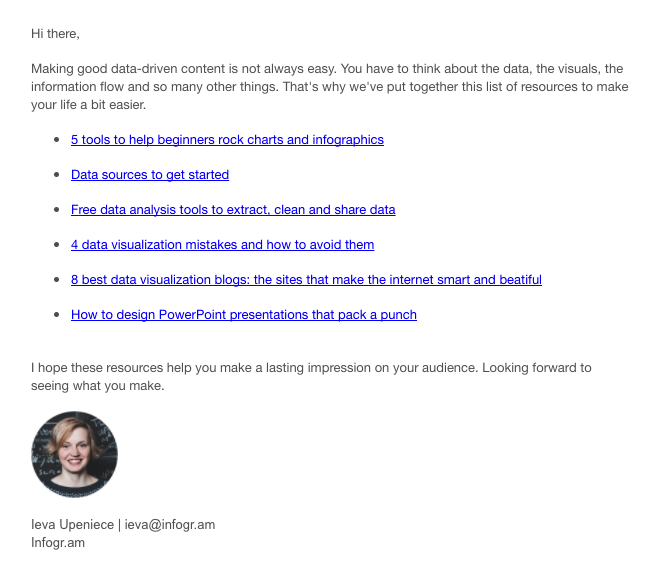 The personal introduction is a great way to start building relationships with your users. Whether it’s discussing your values or providing content that you know people will find valuable, you’re working on building something for the long-haul. So don’t worry too much about immediately converting people. Instead, dial down and measure using metrics that prove that your initial efforts are succeeding, like reply rates, clickthrough rates, and smaller behavioral conversion rates. If email isn’t your primary channel for customer feedback, or you’re simply more focused on conversion than on conversation, the immediate conversion-style post-welcome email may be what you need. This type of message is always designed to get you to accomplish one quick thing, whether that’s taking an action within a product, inviting or referring a friend, or opening up your contacts. Let’s say you have a social consumer product. 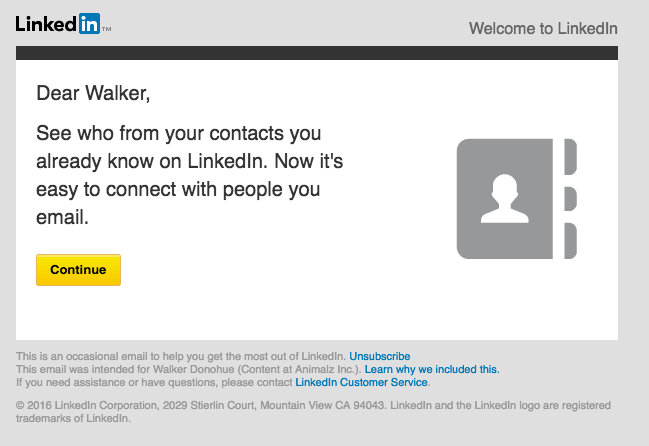 You might send an email designed to make it super-simple to see if you already have connections on the platform, like LinkedIn does: This spare interface and prominent call-to-action button are hallmarks of conversion-centric design. LinkedIn knows you’ve been to their site, they know you understand the value of the product, and this is their rigorously-tested vehicle for you to start fully participating. 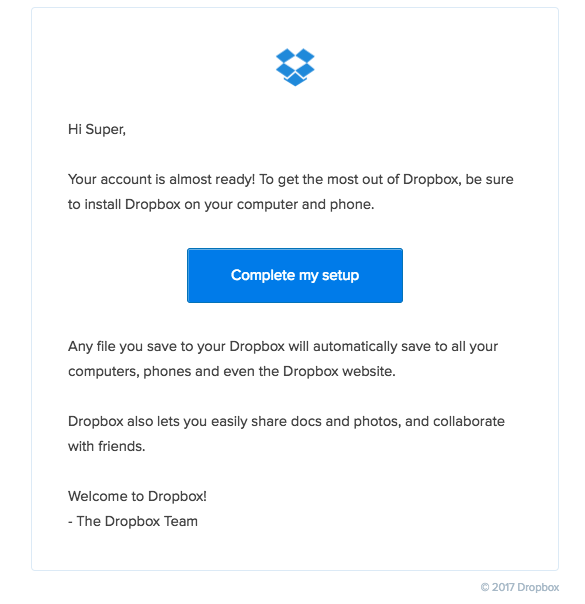 Dropbox uses a quick conversion email to get you to download the Dropbox apps onto your computer and phone. They know that the more Dropbox apps you have around you, the more likely you are to start using Dropbox regularly. The best quick conversion emails use some kind of operational leverage to get huge results. Done right, the quick conversion email can be an effective mechanism of growth. When selecting an action to drive users towards, make sure you’ve figured out (or are testing) whether that action benefits your product’s growth in a meaningful way. 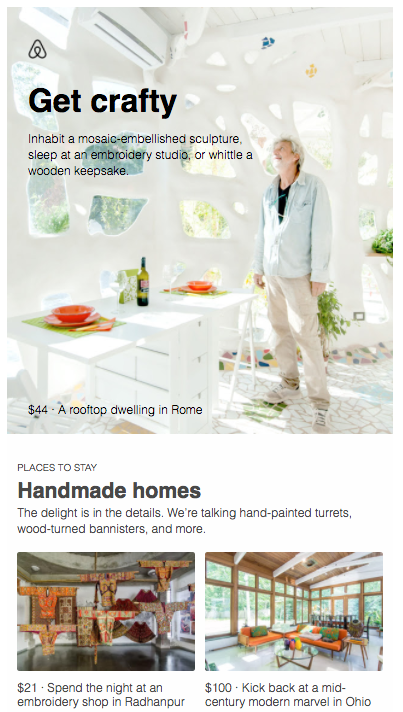 view full email After registering your account, Airbnb will periodically send a curated list of places you could go. Each featured listing in the email functions almost like a landing page or a new conversion opportunity to make a booking. You can also use the value-sell message to help new users get acclimated to a product or remove onboarding friction. Here’s an example from Airtable, a collaborative database tool. 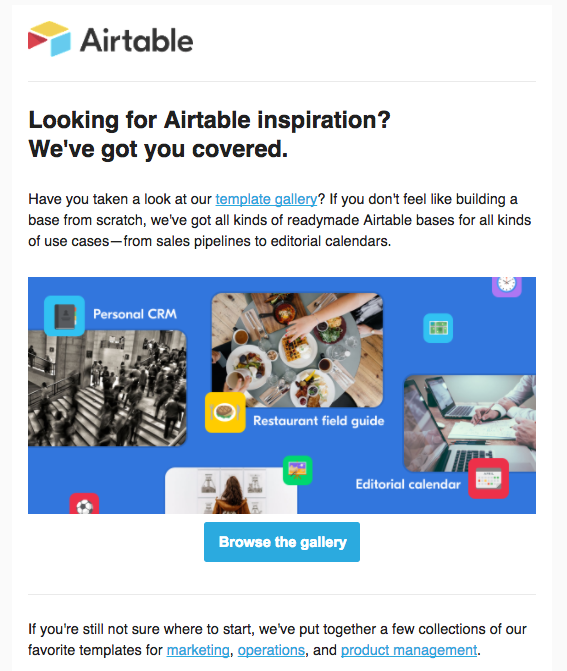 view full email Airtable’s post-welcome email provides useful templates for you to get started in their tool. New users will stick with or move to another tool that’s more immediately easy to understand if they don’t understand Airtable’s relational database capabilities. So the content isn’t designed to push a sale and upgrade from a free account but to help you get more out of the product. The value sell is a bottom-of-funnel technique on a longer timeline, making it particularly well-suited for continuing product education and building relationships with customers who have larger lifetime values. The “close” is about converting evaluators into customers, used by companies with shorter marketing funnels. For example, you might use a closing post-welcome email when your product has an extremely short trial or demo period, as with screen recording software ScreenFlow. When you download and use it, any recording you make has a large, obtrusive watermark. A bit later, you get an email thanking you for downloading the trial, pointing out the watermark, and prompting you to purchase a license. The product can’t be used in its demo state, as the watermark is simply too pronounced. This is an effective technique largely because of the velocity at which new users move through their funnel. People try the product, see how it works, and then are soon prompted to buy. If they got a glimpse of the product’s value, they’ll be ready. The closing email can be more subtle than this if you have a longer-term value proposition. In this example from the Wall Street Journal, signing up for a subscription triggers a post-welcome email that offers you “exclusive access” to the WSJ+ community: As part of the WSJ+ community, you get access to opportunities like talks, getaways, and other exclusive offers. The Journal is riding that post-purchase crest of a wave to upsell you. While subscription revenue is nice, it’s the margin on vacations and getaways that can really drive bottom-line expansion for a publication like the Wall Street Journal, and post-subscription is a favorable time to show these selections. It’s easy to send a clunky close-like email at the end of a lifecycle campaign (“Buy Now — 10% off!”) when it feels like everything else has failed and you may as well take the shot. But if your business model supports it, it might be worth moving it up to be the second arrow in your quiver. The close is often misused as the begging, last “Hail Mary” email in a drip campaign. Instead, if your model relies on a quick customer funnel or converting higher-value customers, experiment with trying to close in your post-welcome email. What stage of the funnel are my customers in when they get this email? Is my goal to get people to convert, or am I trying to build a relationship and convert down the road? Sending out a casual, plaintext greeting because you feel like it’s the “startup” thing to do, or sending an aggressive coupon code campaign every day because that’s the prevailing approach to building revenue — these are just different iterations of a grab bag strategy. Instead, tailor your post-welcome email to your business model and what you’re trying to accomplish. You only have one chance to make a second impression. It’s up to you! 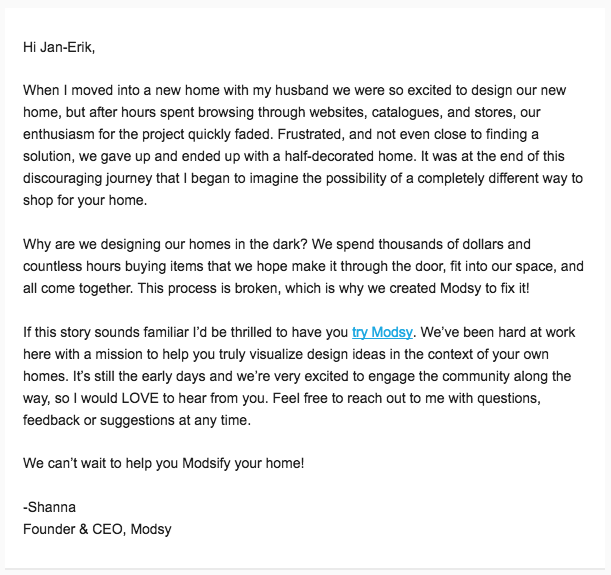 What successes or failures have you seen with post-welcome emails? Share with us in the comments below!